Weapons Grade cute shoes for kids! These beautifully sculpted Chucks sneakers are so much fun; like Bunny Slippers, but not bunnies, and not slippers. 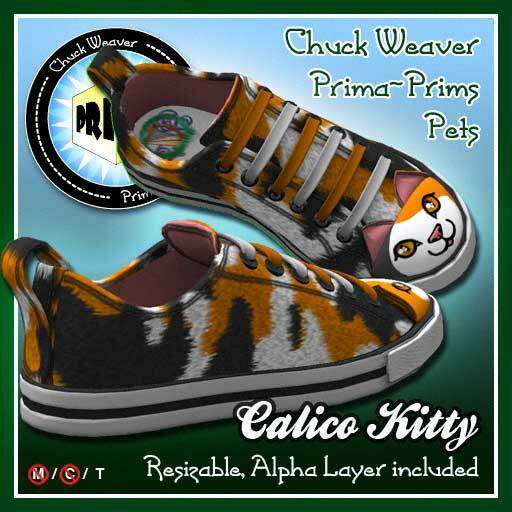 Each shoe has a wonderful kitty face and darling ears on the front, and a tail behind. These shoes are slip-ons, so there's no bow, and the laces are arranged like a ladder. Each shoe includes a resize script for a perfect fit. The script resides in only one prim, so they won't cause lag, and you can delete it when you've got the size you need, so your shoes won't have any scripts in them at all! Available from Kick the Can in world, and the SL Marketplace. L$150 a pair. NO Copy/NO Mod/YES Transfer. Demo shoes available at the store, so you can try before you buy! You can buy Black, Calico, Siamese, or White from the SL Marketplace, or go to Kick the Can in Livingtree in world, try a demo, and purchase any of them there.